Welcome to the Yester-Epcot Canada pavilion. Your park guidemap indicates that the attraction here is O’ Canada in Circle-Vision 360, but the real attraction is on your show schedule. 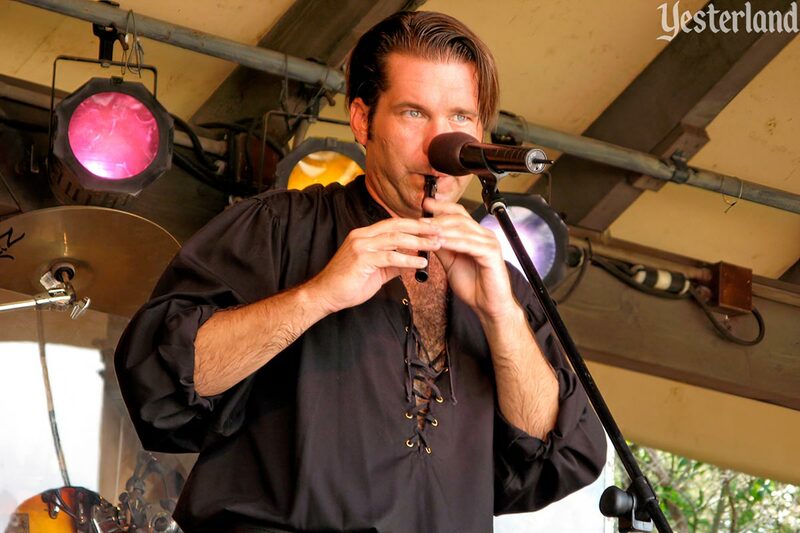 It’s Off Kilter—playing high-energy Celtic rock interpretations of traditional and not-so-traditional songs. You might hear “The Bonnie Banks o’ Loch Lomond” and “Misirlou” (the theme from Pulp Fiction) in the same set! 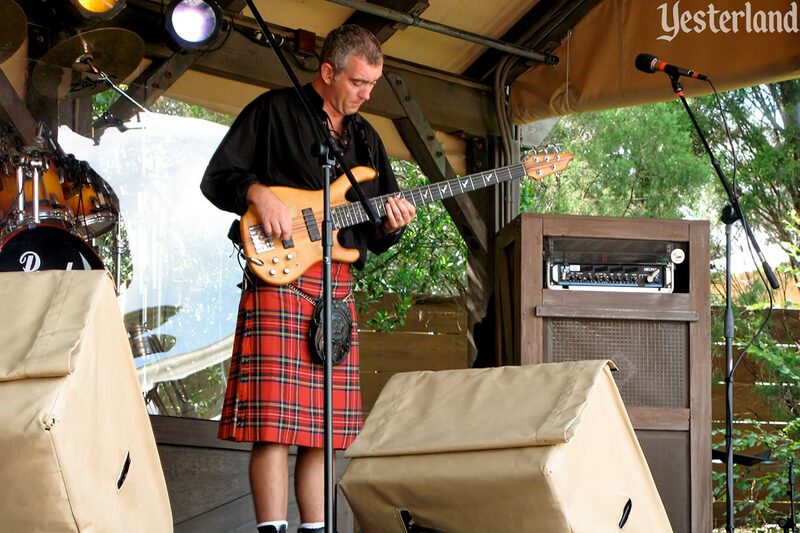 In both cases, the electric bass meets bagpipes. You can often catch a show by luck, just by walking by at the right time. But try to catch a whole set from beginning to end. It’s one of the best things at Yester-Epcot. Find a seat under an umbrella—unless regulars have already grabbed all the good seats. There’s plenty of standing room. 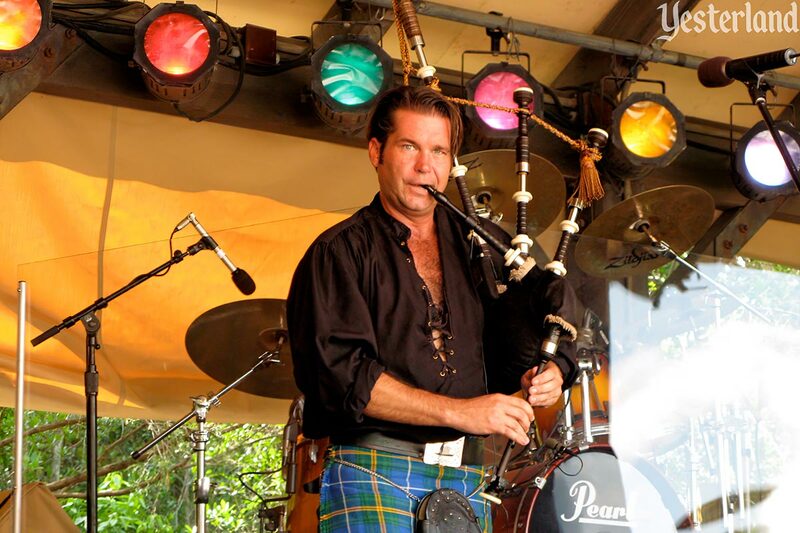 You probably connect bagpipe music and men in kilts with Scotland, not Canada. But Canada had plenty of immigrants from Scotland who brought Scottish culture—including bagpipes and kilts—across the Atlantic. Jamie keeps an eye out for cameras. Point your lens at him. He’s likely to give you a perfect pose—freezing long enough to give you a great shot, albeit with eyebrows raised and an artificial smile. After the performance, check out the CDs. If you forget, or some of the CDs are sold out, you can buy the same CDs through the “Merchandise” tab at the band’s official website, OffKilter.net. 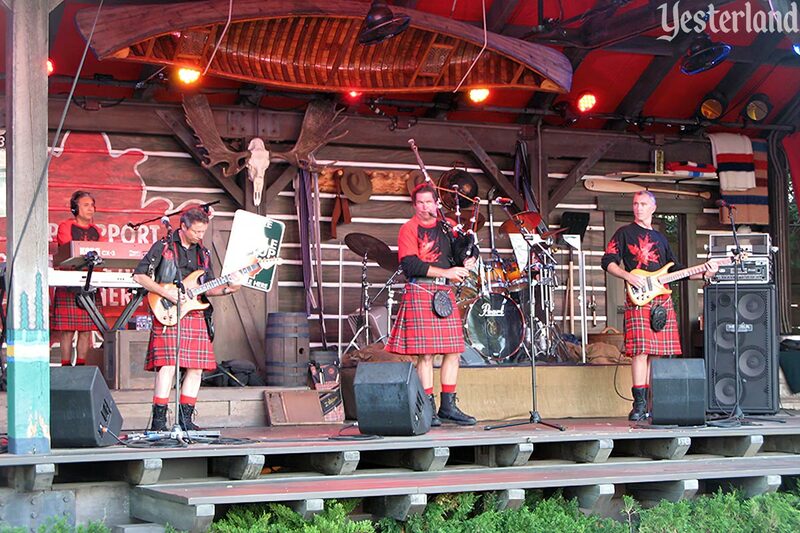 Off Kilter debuted at the Canada pavilion in 1997. The band drew big crowds while playing on a stage right on the World Showcase Promenade, clogging the walkway. 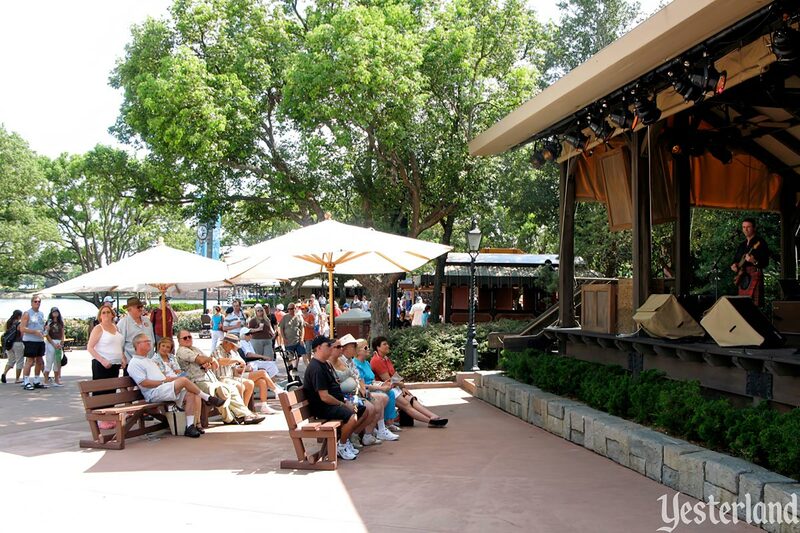 Disney built a new stage, set back from the walkway, to accomodate the audience. 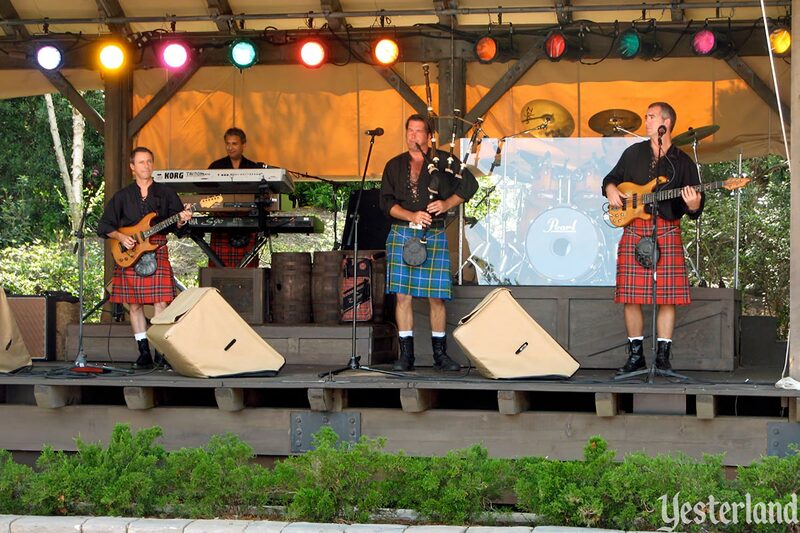 Some World Showcase acts do the same show every time, but Off Kilter kept their shows fresh, making them highly repeatable. Over the next 17 years, Off Kilter developed a loyal following. On August 28, 2014, the official Disney Parks Blog posted that new entertainment would be coming to Epcot—“a traditional Berber music and dance troupe in Morocco, a corps of dynamic flag-waving performers in Italy, a thrilling lumberjack-inspired show in Canada, a Celtic folk music ensemble at the United Kingdom, and more.” New entertainment! Great! As we embark on this enhancement of World Showcase entertainment, we bid a fond farewell to Mo’Rockin’, Off Kilter, Spirit of America Fife & Drum Corps and World Showcase Players. We thank these performers for all they’ve done to make the Epcot guest experience enjoyable and memorable, and we invite you to come out and see them in their farewell performances over the next few weeks. Fans of Off Kilter were not pleased. A “Save Off Kilter” Facebook page quickly drew thousands of followers. Fans on discussion forums hoped Disney would see the decision as a mistake. But nothing changed. 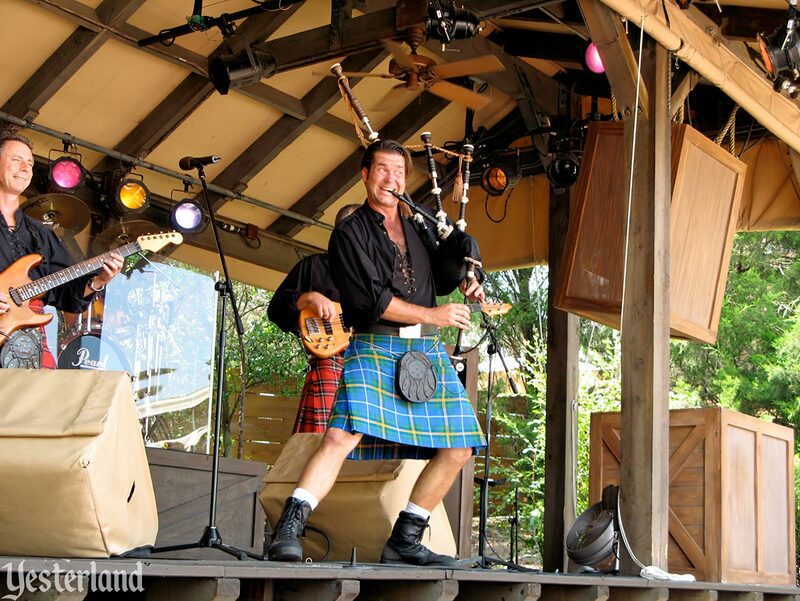 Off Kilter’s 7:30 p.m. performance on September 27, 2014 was the band’s final Epcot show. The enthusiastic audience demanded more—and got encores of “Magic Carpet Ride” and “Born to Be Wild” in the inimitable Off Kilter style. Off Kilter stayed together. The band’s tour schedule primarily involves playing festivals. The Canadian Lumberjacks demonstrate the time-honored tradition of Canada’s great timber and logging eras in a thrilling and friendly competition, featuring axe throwing, chopping, log rolling and more daily for guests at the Canada pavilion at Epcot. 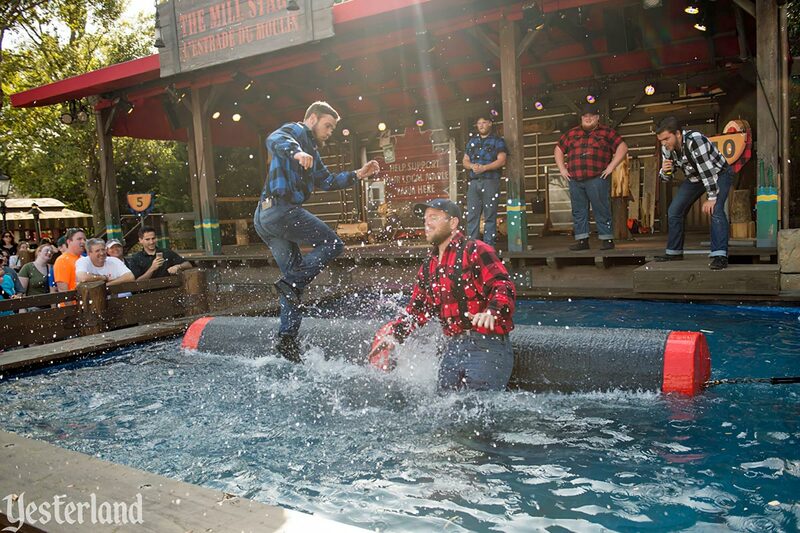 Presented as a competition between two teams of lumberjacks—the red team and the blue team—each show ran around 15 minutes. 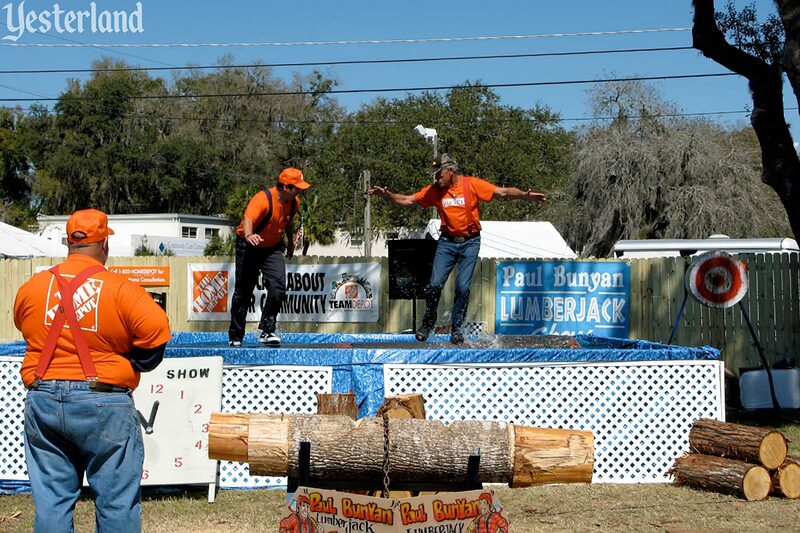 Disney did not have to travel to Canada to find lumberjack talent—only to nearby Kissimmee, Florida. That’s the home base of the Paul Bunyan Lumberjack Show, a company that has been doing lumberjack demonstrations and competitions for more than three decades. 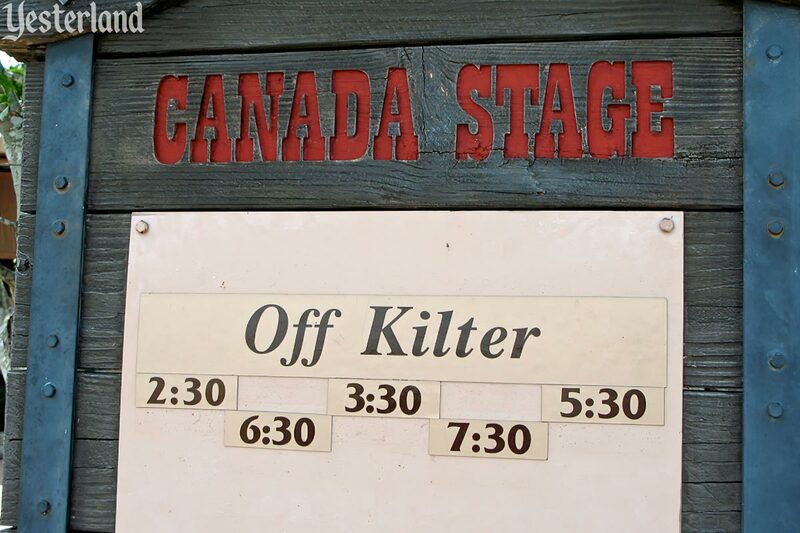 Off Kilter was a hard act to follow—and the Canadian Lumberjack Show failed to find a lasting place at Epcot. 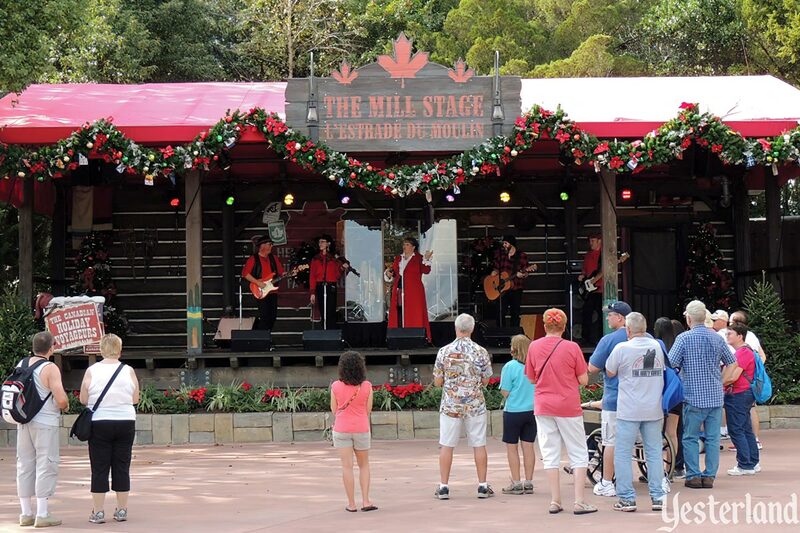 The final lumberjack performance was November 24, 2015 at 6:15 p.m.
After the lumberjacks packed up their saws and axes, the next show on the Mill Stage was a “musical exploration of holiday traditions from across the Great White North,” performed by the Canadian Holiday Voyageurs. As a 2015 holiday offering, it paled in comparison to other “Holidays Around the World” acts, such as Sigrid and Julenissen at Norway or the Chinese Lion Dance at China. And as a music act, it paled in comparison to Off Kilter. As of the publication date of this Yesterland article, there’s no official word on the next act at the Canada pavilion’s Mill Stage. 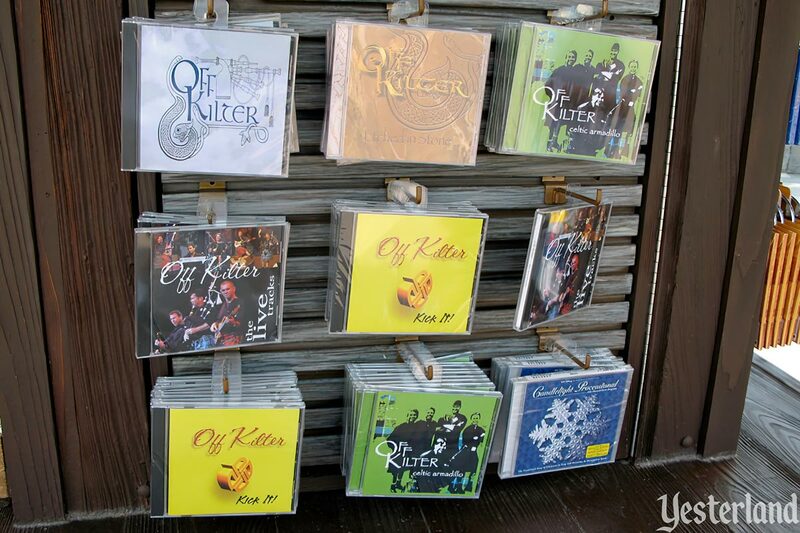 Off Kilter is working on their sixth album—their first new album in 10 years—using Kickstarter to cover the upfront costs, such as studio time and CD mastering. As is normally the case with Kickstarter, backers at various levels will receive rewards, such as the CD or an Off Kilter t-shirt—along with being able to feel good about being a backer. The Kickstarter campaign is in its final days (as of the publication date of this article). It only goes through Wednesday, January 6, 2016, at 7:00 p.m. EST / 4:00 p.m. PST. You can still pledge until the deadline. 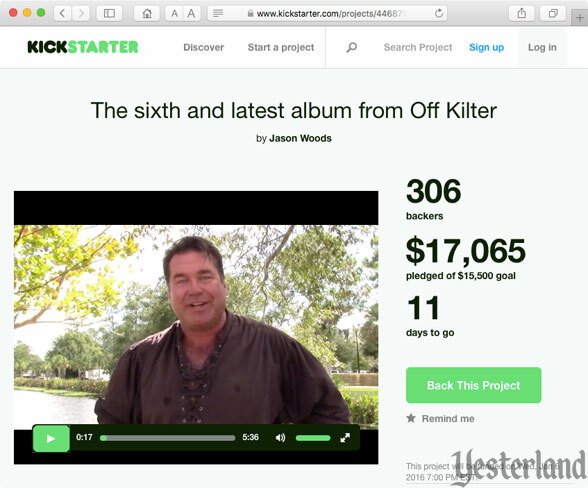 There’s good news: Off Kilter’s Kickstarter campaign has already passed its goal. That guarantees that they have enough to proceed. It also guarantees that you will receive the rewards at your pledge level. The more they exceed their goal, the more they’ll have the resources to produce a great album. To learn more (and to enjoy a short video), click on the image above or this link: Kickstarter for “The sixth and latest album from Off Kilter”.